In this cute slider puzzle game you're a little dragon and need to rescue your babies who were frozen solid. Get in the fridge and use your fire breath to free them! Rotate and slide the puzzle pieces to create a path so the fire can reach your kids and unfreeze the tiny creatures. 50 challenging levels are waiting for you! Can you collect all stars in this addictive brain game? 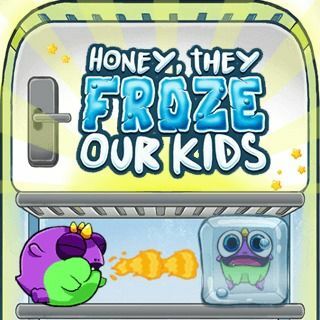 Honey, They Froze Our Kids - Find Honey, They Froze Our Kids in our vast HTML5 games catalogue. Only the best and newest HTML5 games for all audiences. Guaranteed success with Famobi.